We’ll design and build a solar power system perfectly suited to match your needs. Have you had your Solar System checked or serviced lately? An underperforming Solar System is not only costing you money but can also be a fire hazard. For as little as $220 for a 1.5 Kw system Larkin Electrical and Data will have a solar accredited electrician check your Solar System. Under the Victorian Electricity Generating Code Section 7, you must check and maintain your solar system to ensure it’s operating correctly and safely. A high percentage of solar systems that we have checked in the past are underperforming. We have also found that cleaning and maintaining your solar system will increase the overall efficiency by 10%. If one of your solar panels is dirty or has a bad electrical connection it will affect the entire system as your panels are connected like a daisy chain. One bad or dirty panel equates to an unperforming solar system. One bad electrical connection can cause a fire. Contact us today for a safety and service check. Fact: LED Lights will save you money! 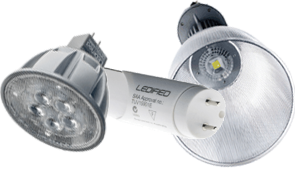 Retrofitting LED lights is the best energy saving investment you can make? From LED downlights in the home, to LED highbays in the warehouse and everything in between, Larkin Electrical & Data has the expertise to make sure you get the right LED lights for your home or business. LED downlights have an average lifespan of 50,000 hours - that’s more than 12 x the lifespan of traditional Halogen downlights - and they use less than 25% the amount of energy. As a guide, here’s a quick example of comparative running costs between a 50w halogen and a 10w LED. Contact us today for a Lighting Audit that will save you money. You can dramatically reduce you electricity bills by installing a Solar PV system on your home. Larkin Electrical & Data can help you assess what size Solar System you require based on your homes consumption. Your Solar System will take advantage of Melbourne’s sunny climate by not only helping to save the environment by decreasing your carbon footprint but also by putting money back into your pocket. A solar power system consists mainly of two parts that are essential in converting energy from sunlight which is useable to power your home and household devices; these are a photovoltaic device / solar cell (PV Solar Panel) and an inverter. Since its first construction in 1880 by Charles Fritts the solar or photovoltaic cell has advanced considerably over the years. 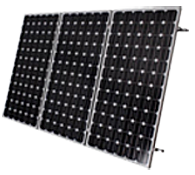 Solar cells contain photovoltaic materials of silicon, telluride and sulphide and are combined to create a solar panel. The solar cells are made up of multiple layers that act as semiconductors building up an electronic field as soon as they are exposed to sunlight. The current generated can be used to power an external circuit. The electrical current from the solar panel consist of a unidirectional flow of the electric charge, and is therefore called a direct current DC (same as batteries). Most household devices only operate on an alternating current (AC). An inverter or power inverter is a device needed to can change the current from DC to AC. 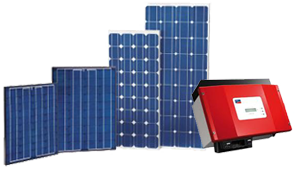 An inverter is essential to your solar power system to produce energy that normal household devices can use. Carbon Footie is installing products from worldwide known suppliers like Sharp, Astronergy (Solar Panels), Suntellite (Zeus), SMA and Fronius (Inverters). For more information or a quote on installing solar panels in your home please contact us. You'll be a amazed at how much you can save. Fill in your details below to see. Calculation above is an estimate based on data provided by the Clean Energy Council which assumes 50% of electricity produced is used and the remainder fed back into the grid. For a guide to Solar PV from the Clean Energy Council please click here. ** Reduction in greenhouse gas emmissions is estimated based on amount of electricity not needing to be supplied by the grid. Amounts are calculated on a state-by-state basis using information from the National Greenhouse Accounts (NGA) Factors - table 40, July 2010. NB: All information contained in the above is for illustrative purposes only and your actual savings may differ. Please contact one of our trained solar specialists to discuss your specific circumstances now.